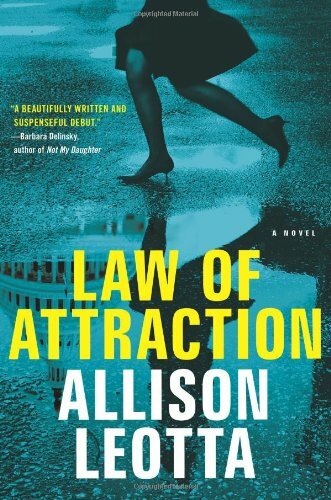 Allison Leotta’s expertise as a federal prosecutor permeates every page of Law of Attraction, her debut legal thriller. She wastes no time in throwing us onto the emotional rollercoaster of domestic violence prosecutions, where the victims often turn on the prosecutor and work hard to free their own abusers. The story begins by introducing us to Anna Curtis, a new Assistant U.S. Attorney in Washington, D.C., interviewing a woman beaten up by the father of her children. The victim’s pain and humiliation jump off the page. We feel the danger that the victim faces at the hands of her abuser. We, like Anna, are ready for justice. And the case seems strong: The victim is cooperative; her injuries are documented. Then it all falls apart. The victim recants at trial. Her abuser is set free. The victim turns up dead. Anna is devastated that she failed to protect a woman psychologically unable to protect herself. Complicating matters further, Anna’s boyfriend decides to represent the man that Anna is certain killed her victim. Law of Attraction is compelling on multiple levels. First, it is a fast-paced legal thriller. Secondly, and more importantly, it is a glimpse inside the world of the troubled psyche of domestic violence victims. Their world is not black and white. It is not always easy to see who is the good guy and who is the bad guy. It is an impossible world where the person who is supposed to love you the most becomes the instrument of your pain. We see the abuser through the victim’s eyes as monster, lover, and parent. We also see the differing prisms of attraction. With Anna’s relationship with her defense attorney boyfriend, Leotta shines a light on those liaisons that are not overtly “dangerous,” as in physical abuse, but are potentially just as toxic. There is a mirroring of the dark dynamic of Anna’s victim’s romantic relationship with Anna’s own. The novel challenges Anna’s easy judgments of other people’s “bad choices” and forces her to look at her own. This is both an entertaining novel and one with psychological teeth. Don’t pick it up if you have anywhere to go any time soon. Mary Hanlon Stone is the author of Invisible Girl and a Los Angeles Deputy District Attorney specializing in cases of sexual assault and domestic violence.